This beautiful video comes to us from our Hypnobabies Instructor April Woolard from St. Louis, MO. 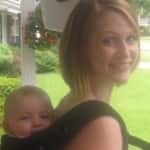 April does such an incredible job of explaining all the techniques she used and how they worked for her during her birthing time. Here is Samuel’s beautiful peaceful Hypnobabies Birth. This short video begins when I was around 8 1/2-9 cm dilated because I really didn’t truly know I was in labor. I thought I was practicing my techniques through my “braxton hicks” which I got frequently anyway. I was 38 weeks and had been extremely busy that day so no footage from the beginning. It was completely awesome, amazing, so empowering to be so in tune with my body and baby. I can’t wait to do it again in March. I loved Hypnobabies so much I am now teaching this 6 week series in the St. Louis, MO metro area. You can view this wonderful video HERE.